From actor/director Ken Marino (HOW TO BE A LATIN LOVER), DOG DAYS is a hilarious and heartwarming ensemble comedy with an eclectic cast of characters both human and canine. Elizabeth (Nina Dobrev) is a charming newscaster, settling into single life and battling the on-screen chemistry with her new co- anchor, former NFL star Jimmy Johntson (Tone Bell) while seeking advice from her dog’s therapist Danielle (Tig Notaro). Tara (Vanessa Hudgens), a spunky barista, dreams of a life beyond the coffee shop with her crush, hunky vet Dr. Mike (Michael Cassidy,) while her friend Daisy, (Lauren Lapkus), a lovelorn dog walker, is enamored with a client she hasn’t quite met yet. Meanwhile, Garrett (Jon Bass), owner of New Tricks Dog Rescue, pines after Tara, while trying to keep his struggling dog adoption business afloat. Soon-to-be parents to twins, Ruth (Jessica St. Clair) and Greg (Thomas Lennon) reluctantly leave their big mischievous mutt in the care of Ruth’s brother Dax (Adam Pally), an irresponsible man-child in a band with his ex-girlfriend Lola (Jasmine Cephas Jones). Grace (Eva Longoria) and Kurt (Rob Corddry) anxiously await the arrival of their adopted daughter Amelia (Elizabeth Caro), whose life inadvertently converges with that of Walter (Ron Cephas Jones), an elderly widower who’s lost his overweight pug. Tyler (Finn Wolfhard), the neighborhood pizza delivery boy, befriends Walter and helps him search for his beloved pet. 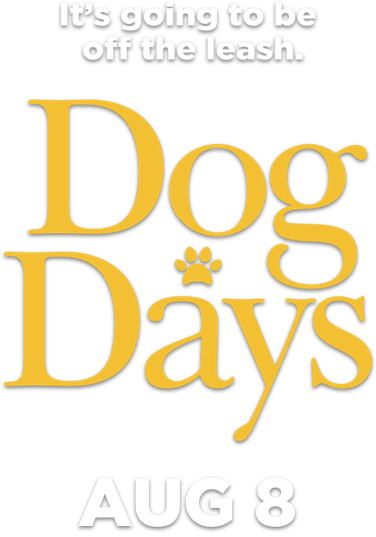 DOG DAYS highlights the everyday connections between people and their dogs in Los Angeles as they uncover life lessons and new relationships in this romantic comedy in the vein of LOVE, ACTUALLY and CRAZY, STUPID LOVE. © 2018 LD Entertainment. ALL RIGHTS RESERVED.